Plan 3 will show that the entire portion eastwards from the fifth pylon, or in other words the rear section of the temple of Karnak, was surrounded by a girdle-wall. What remains of this is embellished with reliefs of Ramses II sacrificing to the various deities. His colonnade at the far end just outside this girdle-wall is now a jumble of ruins and beyond this is a small temple also built by him, and an ancient gateway which dates from the time of the Ptolemies. 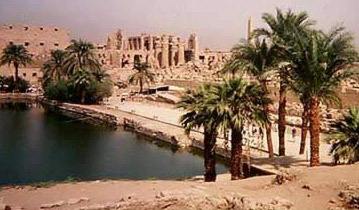 To the south of this section of Karnak is the Sacred Lake, the symbol of Nun the eternal ocean, where the priests of Amon purified themselves in the holy water. Unfortunately too few of the hewn rocks survived the years to allow of genuine restoration. The gigantic stone beetle or scarab that overlooks the lake was one of four placed there by Amenhotep III in honour of the Sun-god.